While the rest of the country celebrates the start of fall and the onset of the cooler weather, here in California it is still warm and summer like. It is actually some of the best weather of the year for getting outside and playing. 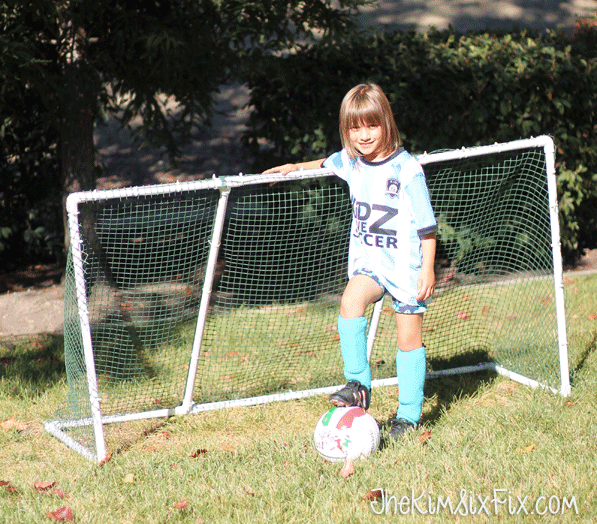 So today, I partnered with the California Milk Advisory Board and the Fuel up to play 60 campaign, I’m bringing you this super short, easy and inexpensive tutorial to build your own soccer goal, which gives kids a reason to head outside and play! My youngest daughter is an avid soccer player and I thought DIY’ing our own soccer goal would be a great way to get her outside and playing. A lot of school children in California aren’t getting enough exercise on a daily basis and the Fuel Up and Play 60 Program (in partnership with the National Fooball League, the US Department of Agriculture, and the National Dairy Council) encourages kids to get outside and play for 60 minutes a day. This program also encourages kids to “fuel up” with low fat dairy products, lean meats, whole grains as well as fruits and vegetables. California schools can participate in the program and can apply for up to $4000 in funding if they are eligible. As a result, 38 million students are eating healthier and getting more active! That is a huge win! You will want to use plenty of zip ties to hold the net on. I went back and cut off the tails on all the zip ties when I was through. It gave it a much cleaner appearance. Here is the final goal. I thought it looked really great for being DIY. But the best part is that my daughter likes it, and if that encourages her to get outside. This is a sponsored post on behalf of the California Milk Advisory board. For my full policy on sponsored content, please visit this post.